Fair Isle Bird Observatory: the Warden's diary: Richard nails his Collared at the Mast. Roger (the Directors have timed their meeting rather well for birds this year! ), Will and myself were soon on the scene and were greeted with a bird exactly as described by Richard: greyer than a Pied, with a very large white primary patch virtually reaching the edge of the wing. It looked good for Collared and the decision was made to trap the bird to confirm the identification. After a short wait (during which it made its way to the top of the Mast and our hearts were in our mouths as we worried it was off to somewhere new), it dropped into the net and we quickly went to work processing the bird. 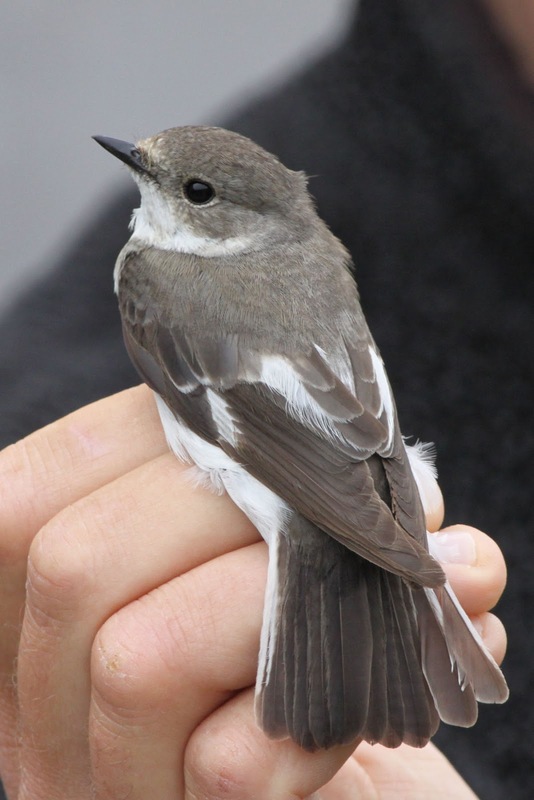 Measurements were taken, feather detail was checked and the bird was confirmed: female Collared Flycatcher. The happy crowd that was gathered were informed before the bird was released back at the Mast, where it continued feeding happily for the rest of the day. The Subalpine Warbler was still at the Obs, the Red-backed Shrike was still around Schoolton, with another at Pund, and other migrants (several of which were lingering from early in the week) included 11 Whimbrel, Short-eared Owl, Swift, Wood Warbler, Redwing, 3 Willow Warbler and Snow Bunting, whilst a Pied Flycatcher was trapped in the afternoon, providing a nice comparison with the day's star bird. Whilst we were releasing the Collared Flycatcher, Teresa phoned from Lerness to let us know she was watching a large pod of dolphins. 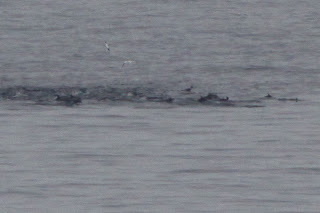 Off we went and had distant views of at least 100 dolphins to the north-west of the island. 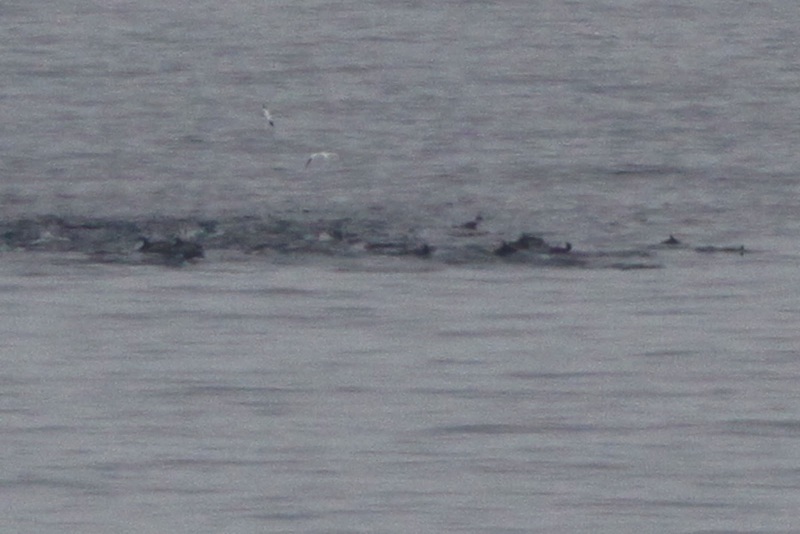 Although initially suspected of being Common Dolphins, it seems most likely they were White-sided, they provided quite a spectacle anyway and another highlight to an already brilliant week! Notice the size of shape of the white primary patch. 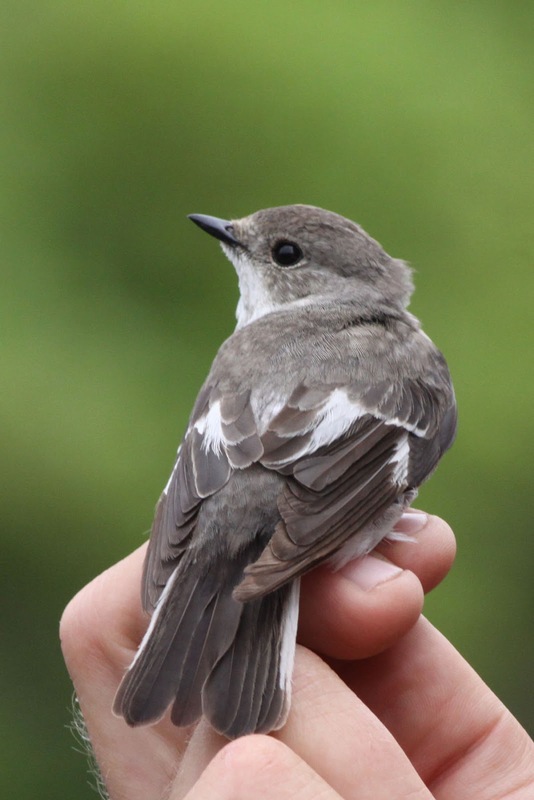 The overall grey tone of the upperparts were also a clue to the identification, although the female ficedula flycatchers are a notoriously difficult group to identify. If accepted, this will be the 5th record of Collared Flycatcher for Fair Isle, with the others comprising three spring males and a first-winter bird.